I am sick! How sick? I am trying to *give away* (!) my tickets for this show, that’s how sick. And it has been raining all day. Pouring! And the weather report calls for thunderstorms this evening. You know, the kind with lightning. To put it mildly, I am not up for going to an outdoor concert. Not even by the greatest live act ever, the E Street Band. Last night, as I was lying in bed sneezing and gagging, I somehow fell upon a website that was incredibly (and no doubt surreptitiously) streaming the Sunday concert live as it was happening. I tuned in just in time to hear all the encores. It sounded great, closing in on 4 hours. I wanted to be there! And yet I also wanted to die…or at least stop sneezing and practically drowning in phlegm. My live-in nurse was a bit worried about me, suggesting maybe I should be taking it easy. Maybe I should…. And I was reading the twitter stream: “Missing all the old white people from your neighborhood? 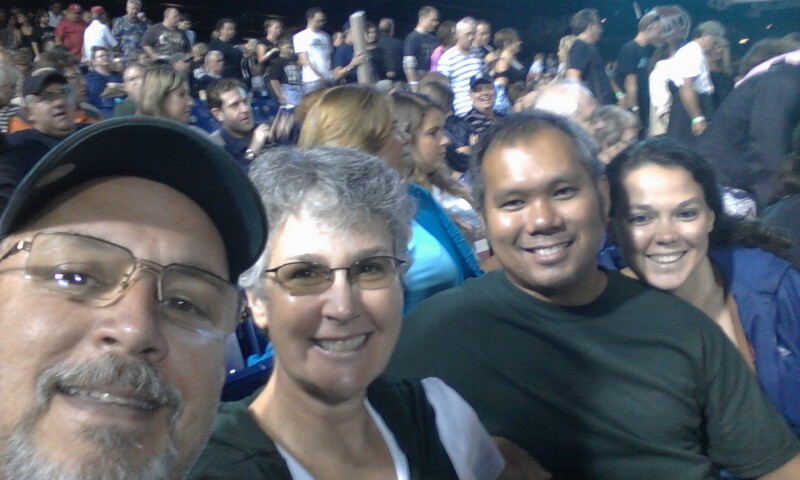 They’re all here at CBP.” “Never saw so much mom-dancing in my life.” Ummm…were we becoming a bit cliche, we aging, middle class, suburbanite rockers? Maybe we were…. 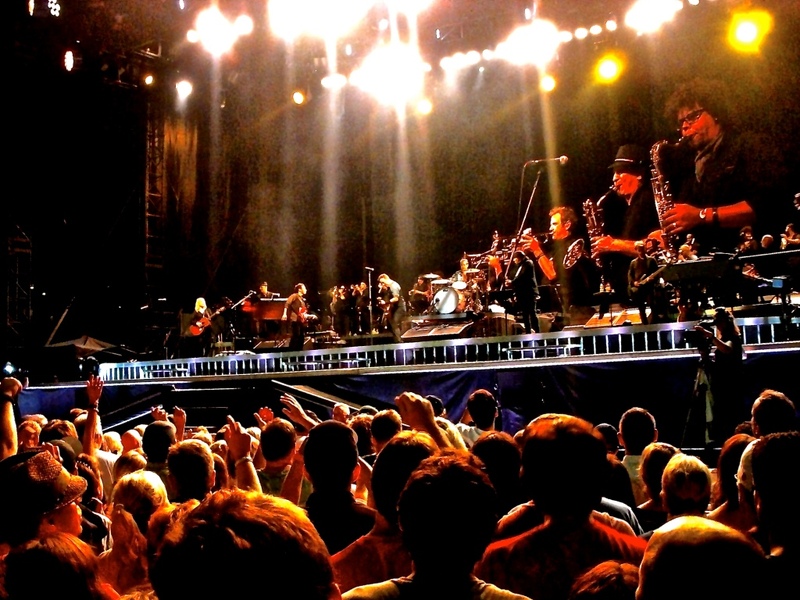 The last time I saw the E Street Band was on our 50th birthday – mine and my nurse’s – in 2009 at the Spectrum. They played the entire Born to Run album in order. Clarence was there, having been hoisted onto the stage with a lift, the poor man. 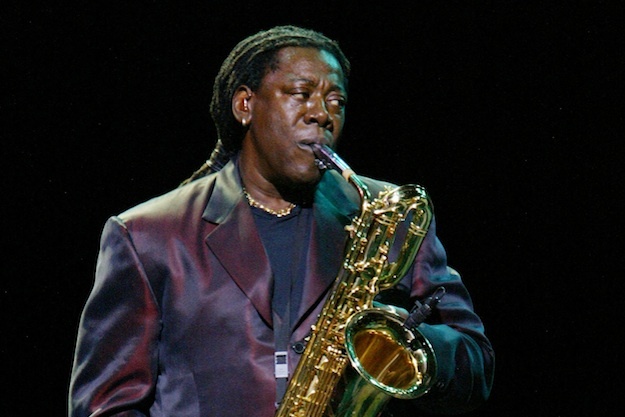 But he could still make that sax sing so strong, so sweetly! Just after this show, they blew up the Spectrum. I figured that would be a good one to go out on…me, and the E Street Band, and the dear old Spectrum, the end of an era. Full circle. Go out on a high note. Don’t push your luck. That sort of thing. Well, that’s my state of mind on this dreary, wheezing day. I decide not to go. I am trying to give away my tickets. But for some completely stupefying reason I am UNABLE TO GIVE AWAY…FOR FREE!… my tickets to the show, to the mutha-frackin’ E Street Band show(!). FOR FREE!! Seriously, WTF is WRONG with us??? Dumbfounded, bitter, hacking up a lung, I decide to just go. I don my rain jacket, stuff the pockets with kleenex and cough drops, and head to Philly with my personal nurse at my side. As we get closer to the Park, the rain lets up. There is no traffic. By some miracle (or perhaps because they cost 25 bucks!) there are plenty of strategically located parking spots positioned for a hasty exit if weather or ailment necessitates. We make our way to our seats, next to our daughter and her boyfriend. I should say something about the boyfriend. By some cosmic improbability (or perhaps because he’s…well, I will not speculate…) the BF has managed to live almost *4 decades* without seeing the E Street Band live! What!?! I *first saw them* almost 4 decades ago. But okay, he is here now, and that’s what counts. All is forgotten. All is forgiven. Before the show, the big screens are soberly warning of the chance of lightning and how if it strikes we should all nicely walk off the field of play as directed by the ushers. Yeah, right. I’m thinking: This is a crowd of, oh, 50,000 people, and I’d bet 49,500 of them are Costanza’s (you know what I mean and you know who you are). But okay, it’s not currently lightninginginging (sp?) and (sneeze, sniffle, snort) it’s not even raining, so I’ll just pretend I never saw that big, black, imposing warning sign. And I’ll just BE HERE NOW. It is not working. Truth of it is, I am not completely present. In fact, I am wallowing in a huge dollop of past, recent past and deep past, my past, our past, mine and the E Street Band’s, mine and yours, maybe. Because I realize that some of you out there in that sea of Costanza’s are my past, and so are, still, my life. And there are more not here tonight who are brought to mind in anticipation of the music that will soon envelope me. A song is playing in my head: “I came for you, for you, I came for you…” Who, you? Who did I come for, when I wanted mainly to be home in bed? I scan the crowd, looking for you, the you I came for. I start to my left, with my nurse. “These are better days with a girl like you,” I sing to myself. I came for you, I think. I came only because I came with you. She is the reason I have absolutely no nostalgia, even as the timeline of my life appears stretched before me on this hot and muggy September night, radiating out from her, drawing me into a past with her, a past beyond and before her. I look a little further down our row, to our beautiful daughter, to her until-tonight-radically-deprived BF, and I think how happy I am to be with them. I came for you two, just because I knew you’d be here and I wanted to be with you, no matter what. Then I turn my gaze out into the crowd, up in the stands, down on the field. I try to see the faces, all the faces, young and old. I am happy to be with all of you tonight, I think (without sniffling, I notice). You young’uns, it’ll turn out, know the words to all these old songs better than I do. You oldies are goodies, still, and the joy you exude floods this place, lights up this night (which is not raining, not a drop), lights up my countenance…maybe even unclogs my nasal passages. I came for you. Yes, I am carrying your hearts, my old friends, in my heart. Those of you who were there and those of you who weren’t, so many of you from my youth. I always have carried your hearts with me, even though you are long gone from me and these are better days, it’s true. Without what we were I am not, such as I am. I came for you. This band wrote a lot of the soundtrack to my life, and you had starring roles in it, and being here gives me the chance once again to be grateful. The lights suddenly go dark, about 8:20. And Bruce Springsteen takes the stage, just him and his guitar to sing about the working life…about a life that works, which will turn out to be the theme of the night. This is the first I’ve uttered the Boss’s name, and this is by design. We saw Bruce Springsteen during his solo Devils and Dust tour, and although I like the songs on that album well enough, that experience was perhaps the saddest of my concert going days. The songs were sad and the man singing them looked lonely. And I felt sad and lonely. 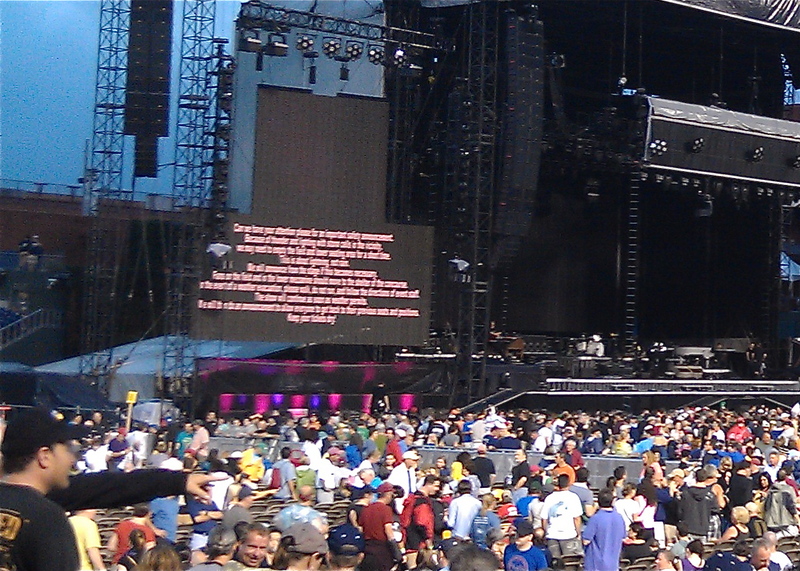 I had come for the uplift you get from a Springsteen show, but something was missing. Now I know what it is. It is the E Street Band, as they hit the stage to blaze through a fistful of songs from that working life album, Darkness on the Edge of Town…perfect for Labor Day in hard times, which come and go and come and go just to come around again. Bruce Springsteen is just another lonely guy, I guess, without the E Street Band, his family, his friends, his cohorts, his partners in rhyme. “Bruce Springsteen,” the object of all our affections is what he is only because the E Street Band are who they are. And they are who and what they are because he is who he is. And if the E Street Band were a football team, all the rest of us would be the 12th man, the fans who round out the team. (Imagine how silly it would look to see a football game played in an empty stadium.) It is all one organic whole, one living breathing body with a whole lot of soul. When we’re not all together, then what are we? Something was missing, so I came for you. Bruce talked about ghosts. You get to be certain age, you start thinking about ghosts…mainly because their numbers start to mount up and because pretty soon…not too soon, I hope…you figure you’ll be joining their ranks. Ghosts: things that used to be but that no longer are and yet still live on. “We are alive,” they sing in your ear, sometimes in just a whisper. Hope. Optimism. Courage. Passion. Exuberance. LOVE. I came for you. 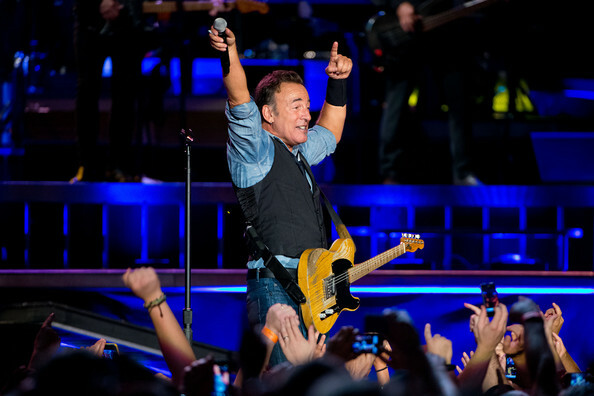 It was a typical — which means extraordinary — E Street Band show. I loved having my wife holding my arm, holding me up, dancing and singing with me. I loved so much watching the BF enjoying the Boss experience for the first time. I loved seeing our dear daughter having such a great time. I loved the raucous crowd from the geezers to the little ones. I loved knowing you were out there somewhere, hearts of my heart. I loved the night, the songs, the show. It was brilliant, of course. And I laughed: At the end, Bruce took off his boots and poured about a quart of sweat out of each one. And I cried: In the middle of the classic song, “Dead Devil in the Freezer,” they had…(what?…really?… ’cause I always thought…no?). Well, heh heh, apparently that song is called, “Tenth Avenue Freeze Out.” Anywho, in the middle of that song there’s the famous line (I’m sure I have this one right): “When the change was made uptown and the Big Man joined the band…” The song broke and big screens paid tribute to Clarence for what seemed like several minutes, during which time the crowd cheered nonstop about as loud as I’ve ever hear a concert crowd scream. It was touching, and I admit I teared up. A ghost, but really alive in all of us who loved having his sound in our souls. So, I came to the show. I came for Bruce’s indomitable and ageless spirit in the night. I came for the heart-stopping, pants-dropping, house-rocking, earth-quaking, booty-shaking, Viagra-taking, love-making – Le-gen-dary E – Street – Band! I came for the healing, for a rock ‘n’ roll exorcism, for at least a modicum of hope. I came for you, for you, for all of you, just to be with you, to find myself once more with you. The only and only Boss! p.s. I woke up the next morning with no sign of illness. Just sayin’.